Anyone who has struggled with Crohn’s Disease or Ulcerative Colitis has probably had their fair share of frustration with western medicine. The treatment choices are usually limited to steroidal medications and dietary modifications. If this prove ineffective then the individual at some point may be looking at a surgical intervention for a bowel resection. However, there’s is nothing in this process that will help heal the body as these medical strategies are only aimed at controlling the symptoms. Not surprisingly sufferers usually end up turning to aspects of holistic medicine in Rochester NY such as Chinese Herbs to help with the condition. CrohnsBy definition Crohn’s Disease is a granulomatous inflammatory process affecting the lower ileum but often including the colon and parts of the GI tract. The symptoms often include chronic diarrhea accompanied by abdominal pain, fever, anorexia and weight loss. Since the cause and pathology are generally unknown often there is nothing for western medicine to measure. Patients generally fall into one of three broad categories depending on their symptoms and usually have to live with it. By contrast practitioners of holistic medicine in Rochester NY often are able to provide alternatives to help these patients. Chiropractors, naturopaths and acupuncturists would fall in this category. In treating crohn’s disease with Chinese herbs an acupuncturist would first determine the pattern the patient would fall into based on an Oriental medical model. Since Crohn’s Disease is an inflammatory process part of the diagnosis would be geared to finding herbs which would help clear heat, a.k.a. inflammation from the body’s intestinal tract. Since gut inflammation is frequently a sign of poor digestion or lack of proper enzymes a practitioner of holistic in medicine Rochester NY could recommend a specific program for the individual which would help with digestion and help heal the gut. It’s important to remember that digestion takes place in the small intestine and anything not broken down becomes a problem for the immune system to handle. Consequently anytime a patient experience redness, swelling or inflammation it’s usually a tell tale sign that enzymes are lacking in the body. 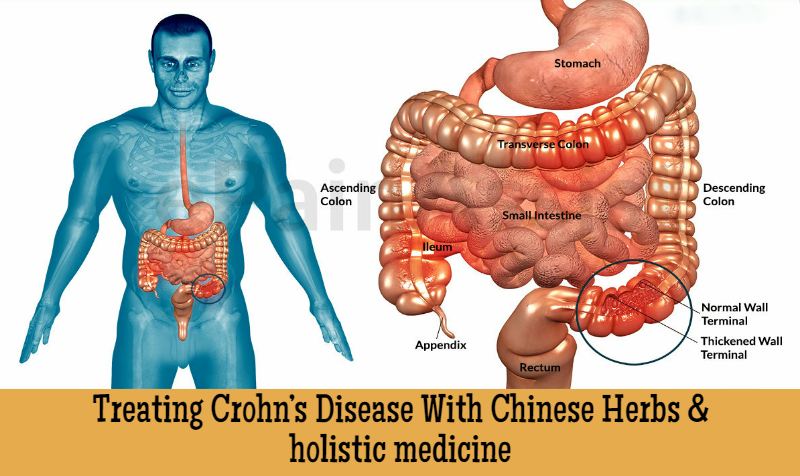 Regarding Crohn’s disease there are a number of individual Chinese herbs as well as formulas which work well in reducing heat and help heal the gut. Such individual herbs as Da Qing Ye, Ban Lan Gen, Chai Hu, Mu Tang and Ze Xie may sound strange and exotic but they are easily obtained on-line or through any natural foods store with an herbal line. The comprehensive formula Chien Chi Tai Wan is also especially useful and fairly easy to come by. When acupuncture is added to the herbal combinations treating Crohn’s disease can become quite effective. At Chiropractic Health and Acupuncture we frequently use holistic medicine to alleviate the problems of Crohn’s disease and other digestive disorders. Located in Penfield the practice serves Fairport, Brighton, Webster. We have been part of the holistic medicine community in Rochester NY since 1983 and offer a free consultation to perspective patients. Are there Chinese Herbs for sweet cravings?